Former School Board member Ketta Brown’s campaign slogan was “Ketta for the Kids.” But as a recently harsh critic of current Board member Dee Perry, Ketta has defined the role of Board members to be loyal supporters for the school district administration. High performing School Boards support high performing administrators, but also hold administrators accountable in a transparent public way for substandard performance. Ketta seemingly never quite got that part about public accountability. On cue Ketta is supporting the denial of Perry’s turn as Board President in 2017 and 2019, which many believe Superintendent Viloria choreographed. The current controversy began when the Superintendent planned the agenda and was present at a special early morning meeting on November 15, 2017. School officials in attendance report no public present, no recording system on, and no agenda item on Board officer elections. Still, Ketta Brown reportedly initiated a discussion resulting in agreement Perry would be denied her turn as President and Vickers would be re-elected. Actual discussion by three or more Board members on who would be elected triggered a Brown Act requirement that the matter be made an item for the agenda of a future meeting. Even discussion sufficient to inform other Board members of one another’s intentions constituted an action by the Board under state open meetings laws. The reports on Ketta’s discussions with Vickers and Wolff need to be confirmed or denied in whole or part by the Superintendent. If a violation of the Brown Act was occurring, the Superintendent had a duty to so advise the Board. The statute of limitations may have passed for Board members, but, if true, reports of the Superintendent’s role seemingly constitute substandard performance on his part demanding public accountability. Taxpayers don’t pay a compensation package worth over $300,000 a year for the Superintendent to lead our Board into a legal trap, whether they get caught or not. This time Ketta and the Board majority are not only supporting the Administration, it seems, but also defending the Superintendent’s apparent failure to protect them from misconduct in 2017. Ketta’s record voting to approve 99 percent of Administration agenda items for 12 years raises questions about whether Board meetings were scripted and contrived rubber stamp sessions instead of actual active and affirmative representation for kids and the community. Many believe Ketta passively acquiesced in Board abdication of responsibilities that enabled usurpation of its powers by LBUSD staff. For example, Ketta Brown, Vickers, and Normandin supported seemingly inept senior staff imposing trendy math curriculum experiments in 2015, with support of Board appointed parent advisor and now Board member Peggy Wolff. Without logical explanation, the Board rejected well-articulated objections by university, engineering, and industrial math professionals in the parent and academic community. Only Dee Perry opposed features of the “Math Pathways” experiment that failed, necessitating diversion of teacher, student, parent and school time, and resources to reverse effects of a multi-year bubble of low math program performance and results. Once affable and socially engaging Ketta Brown now practices politics of personal disparagement, it seems, dismissing Dee Perry, a twice elected professional woman with 35 years teaching experience, as old fashioned and unable to follow “protocols” imposed by the Board but not official. Yet, when answering questions posed by Perry, even the Board counsel hired to defend the Board majority in mounting legal battles conceded the so-called “protocols” Ketta obediently conformed to when she was on Board are non-binding. And in the eyes of many, they are staff driven bureaucratic rituals too. Many of us believe that for 12 years, Ketta was enslaved to Board (and staff created?) norms of political decorum imposed to create appearance of “unity” at the expense of transparent and merit driven and substantive deliberations, and to avoid “surprises” due to independent research daring to challenge staff priorities. So it was Ketta in the 1950s old school mold of weak School Board members seemingly needing to be spoon-fed policy and program by staff, becoming dependent and easily manipulated by career education bureaucrats, it seems. Ketta also argues that the Board President is not powerful because the Board is “in a box” without real authority, deferring to the Superintendent. This misconception is the predicate for putative Board President Vickers’ announced practice deferring to the Superintendent on content of the Board’s agenda without supervision by elected members. Given consistent Board approval of virtually all Administration supported agenda items with almost no exceptions or negative votes, many people ask why we even need a Board. Ketta and Vickers share an illiterate belief the Superintendent leads an “Administration” separate from Board. In the real world of state law the Superintendent is “Chief Executive” in name only, and only as tasked by the Board, without any independent powers whatsoever. By law the Board remains responsible for every exercise of any powers delegated to the Superintendent and staff. Not with parents and teachers but on the School Board, being “for the kids” is too often lost in the confusion. After a courageous decade-long battle with cancer, Kristin Lynn Heaton Peabody quietly passed in her Laguna Beach home on February 7, 2019, surrounded by her loving family. Kristin was born on England Air Force Base in Alexandria, Louisiana, April 15, 1970 – six weeks before her father was deployed to Vietnam. An Austin, Texas-raised girl who attended the University of Texas, she was driven by a fierce determination and entrepreneurial spirit, which was only outshined by her generosity and compassion for others. Kristin is survived by her husband, Wyatt Hampton Peabody; son, Heaton Wyatt Peabody (9); grandmother, Joan Heaton; mother Janice Heaton and Ahmad Modoni; father, Brigadier General Kencil Heaton and stepmother Gayle Heaton; half-sister, Stephanie Heaton; sister, Allison Heaton Thomas and brother-in-law Joshua Thomas; and nieces Meera Eleanor (5) and Nadiya Kristin Thomas (2). Kristin was blessed with the loving care of her sister, Allison, aunts and uncles – Dr. Caryl Heaton Bryant, Stephen Bryant, Dr. Paul and Letha Heaton – who supported her in the last months of her life, as well as many family members and exceptional friends. The family would also like to thank Dr. Ezra Cohen and the extraordinary team at UCSD-Moores Cancer Center and Jacobs Medical Center for their remarkable care. Kristin and Wyatt’s mission to expedite the cure for cancer continues at UCSD through The Peabody Fund, which they established in August of 2017, having exhausted every option for treating her rare form of head and neck cancer. What began as a humble fundraising effort helped launch a first-of-its-kind personalized vaccine trial, thanks to the generosity of the Strauss family and the tireless efforts of Dr. Cohen and his team; subsequently, UCSD and La Jolla Institute were awarded $4.5 million as part of the National Cancer Institute’s Cancer Moonshot initiative for patients with head and neck cancer. Kristin’s commitment to Stand Up To Cancer and Charity: Water will continue to be supported by Hiatus Spa + Retreat in Austin, Dallas, Plano, San Antonio, Ft. Worth and Houston, which Kristin created with her partners and longtime friends, Sheila and Bill Garrison. Private family services are being held in Austin and Laguna Beach. In lieu of flowers, please make donations to The Peabody Fund-UCSD, Stand Up To Cancer or Charity: Water. Finally, the family asks in honor of Kristin, that you vote – in every election – do something to protect the environment every day and stand up for those who cannot speak for themselves. And remember that every day is a gift. It is no small task to receive six-year accreditation from the Accrediting Commission for Schools (ACS) Western Association of Schools and Colleges (WASC)/California Department of Education (CDE). Laguna Beach High School achieved this important and valuable milestone. The final report from the WASC visiting team, available on the LBUSD and LB High School websites, shows the enormous and rigorous process undertaken by our community’s team of students, parents, teachers, staff, and administrators. WASC is the same assessment body that evaluates and guides the fine private (USC, Chapman, Stanford, etc.) and public universities (UC and CSU) throughout California. Notably, the self-study and visiting team reports, and the Single Plan for Student Achievement (SPSA) provide a systematic way for everyone to look closely at what works, what needs improvement, and what steps will help build a stronger educational environment. This excellent result is due to the leadership of involved parents, the local WASC leadership team and self-study coordinators, the school site council, students, our superintendent, educators, and staff at all levels, and our school board in place through 2018. Censor, censure, civility and civics: School Board doubles down on silencing minority voices? It is a tribute to teachers, classified employees, students and families in our public school system that quality education goes on even when the School Board and District staff are spending inordinate resources, time and energy on a governance process in disarray. That includes costly litigation against students and families that could have been avoided, dueling public record requests by anonymous surrogates of the Board majority, “secretively” developed policy and rule revisions, as well as special meetings of the Board and even its policy and bylaw committee, in order to conduct business deemed too “controversial” or “stressful” for regularly scheduled monthly meetings, it would seem. Exhibiting symptoms of besiegement induced cult-like bunker mentality, our School Board is considering a new bylaw allowing any three-member majority to denounce or “censure” a minority member. The Board does not need a censure bylaw, it already has the power to censure a member, and on rare occasions in the past decade perhaps should have done so. The purpose of adopting what to many seems a politically contrived censure bylaw now is seen by many as harassment of Board minority member Dee Perry, for not obeying Board demands that she not openly disagree with decisions of the Board majority. But a censure bylaw without a defined standard of conduct, standard of proof for defined misconduct, is merely a political stunt in the nature of a popularity contest, many believe. As such, the censure bylaw proposed by Board member Carol Normandin is too vague and subjective to meet due process criteria, accordingly having no binding legal effect or enforceable consequences. Perry responded to the poorly drawn censure bylaw sponsored by Normandin by recommending the board consider a censure bylaw with defined misconduct and consequences. But Perry also pointed out that a meaningful censure bylaw – a sample of which she provided to the Board – will escalate the climate of confrontation and lack of civility between majority and minority voices on the Board. The Board is also probably going to pass a new bylaw at its March 26 regular meeting expanding vague, subjective criteria for the Board to deny public and even Board member requests to place matters on the agenda of a Board meeting. Under state law the Board is the District, there is no District except by act of the Board, and the Board alone decides what the visions and goals of the District are and will be. The agenda is based on law and requests that relate to Board business and are within its jurisdiction should never be denied based on other criteria. But even more disturbingly, the new proposed bylaw will import into local rules provisions of state law allowing Board members to form a committee that conducts special meetings that are not regularly scheduled, and are seldom if ever attended by the public. Even without the public present, if the public could have been present and commented on the committee’s proposal, action by the whole Board can be placed on the agenda and voted on by the Board without further public comment. Given repeated blackout of video recordings for recent meetings, removal of items from the agenda if deemed by the District too “controversial” to be recorded, and the increased frequency of irregularly scheduled special meetings at which important policy and bylaw revisions are made or “controversial” matters are addressed, the diversion of such matters from regular video recorded meetings appears to be a strategy for avoiding conduct of meetings with full transparency and public participation. Using public access to Board committee meetings to deny public participation and comment in regular meetings where committee proposals are adopted is a bad model of civic openness and should be utilized rarely if at all under urgent and extraordinary circumstances. Instead of incorporating that procedure into its bylaws the Board should restrict its own ability to utilize that bureaucratic tactic. There is no issue with respect to which this is more true than the elimination and proposed restoration of the so-called “grade bump” policy. Don’t worry, I didn’t know what that term meant when asked in a debate forum to give a one word yes or no answer on whether I supported it. I supported it in the past, present and going forward. I vaguely knew it referred to the practice of rewarding students who take harder courses by giving more weight to grades earned. This reportedly can empower motivated students – including from lower income families – who take harder courses and excel to qualify for scholarships and gain admission to public and private colleges and universities around the nation. By revising its bylaws to embrace the practice of diverting issues from regular meetings to special meetings and committee meetings, the Board is doubling down on its wager that confrontation, lack of civility, discrimination and harassment will be tolerated. The public wants the elected School Board to model fairness, following rules and kindness, to our children and grandchildren. That is not what is happening under the current Board’s policies. We have lived in Laguna Beach for 21 years, and raised three children who attended our local public school system. I confess that now that our children are grown, and that our national and international world consumes much of our attention, I am not following local politics as finely as I might. But, this disengagement with the minutiae of the local issues gives me perspective, and this is what I am seeing from 30,000 feet. Our community has the dubious distinction of having four residents indicted in the Singer/college admissions scam. That’s four out of 33 parents across the whole country, in our little town of just under 25,000! I can’t say I am surprised. I participated in the Coffee Break parent education arm of the PTA for many years. Coffee Break (now Coffee Talk) often hosted experts on how to navigate the entire college selection process, how to enhance your child’s success, etc. and the room was always at capacity for such talks. Naturally, our own family actually went through the college admissions process for all of our children. I personally felt the intense pressures and near-hysteria engendered in the process. I watched as other parents founded charities for their children to run. I watched as the bumper stickers like “Proud (prestigious college) Mom” became fashionable. It all felt weird, skewed away from the children themselves and targeted more toward the cachet of the “designer” brand college and how it would reflect on the parents. But at the same time I felt the fear that if I didn’t pursue the private college counselor, or the extra exam prep, I would somehow be disadvantaging my kids in the heavy competition around the college admissions process. I want to emphasize that for those parents who really went all-in for the joy and pride in their children’s accomplishments, I do understand. And I heartily respect the paths these children are pursuing, most especially when genuinely from the kid. Perhaps unrelated, but certainly troubling to see, is the abrupt change in our local Board of Education by-laws to bar a duly-elected Board member to serve as president. I don’t understand the backstory on this, but read in Stu News this quote from Board member Carol Normandin to fellow Board member Dee Perry: “If you want to be president, you have to know how to conduct a meeting…You don’t know how to conduct a meeting. You caused this ruckus.” The tone struck me as both mean and condescending. And that led to the immediate four-to-one vote dumping the by-laws, clearing the way for another member to serve a third-term as president. So, how are these two individual news items related beyond their obvious education focus? I am not sure. But I feel some light needs to shine in our little town on its own system of values behind education. Our Board of Education needs to behave with civility and respect to its duly-elected members. There should be more transparency on solid issues which are so very divisive as to require the elimination of traditional by-laws. As to the college admissions hysteria? Somewhere all the fear parents feel is motivating less-than-entirely ethical behavior, if not always illegal. It begs the questions: to what ends? And, what are we teaching our kids? Here’s a hint: She did it on her own. My wife and I were too busy with her little sisters, volunteering at school, doing for little ones what we’d done for her. She somehow transitioned smoothly to self-reliance, without needing to compete for attention. I’d take credit for academic achievement, but in truth I was blindsided she was middle school valedictorian. Always asked to help with homework, too nice to tell me she’d passed my math and science skill level! Living on Bolling AFB in Washington, she was competitive on the swim team, school and club soccer, but really stepped up earning stroke position on her crew team. Recruited by the elite Loomis-Chaffe Institute prep school founded by my ancestors in Windsor, Connecticut, I thought she should go. She chose to stay home with her family and friends, and go to D.C. public high school. College was still over the horizon for me when she suddenly proposed options and budget for SAT prep courses she researched! Next thing I knew Michigan alumni wanted to fly her up to Ann Arbor for a game, military academies recruiters were at war over her, her counselor thought Yale was realistic, and she chose Stanford. She got in, spent four great years at an amazing university, but what does she value most? Lifelong friends from all over the country and world, who she sees for reunions at least once every year. If I did anything right it was never going to happy hour with co-workers. As a young Navy lawyer working long hours on White House staff, if I wasn’t on duty I was with family. Lots of invites to coveted “career opportunities” after hours, but if I couldn’t bring my wife and kids I didn’t go. I never missed kids’ weekend sports, loved sitting on the bed telling my own children’s stories, repeated by popular demand for friends on sleepovers. Bedtime reading included “Treasure Island” and “Island of the Blue Dolphins,” until I became one more dad replaced by “Diary of Anne Frank.” We still fast forward the “When Somebody Loved Me” scenes in “Toy Story 2” about girls growing up, they know I can’t get through it. If we helped her it was constant big extended family dinners with teachers, diplomat families from around the world. Thanksgiving once included a nun from Belgium, international lawyer from New Zealand, a Senator from Palau. Then there were D.C. to Laguna Beach road trips, long vacations back home. What we learned from her is that wherever you go to school, what matters is feeling a valued member of a learning community. I thought about that when I spoke at Thurston Middle School on career day, because I saw kids under pressure asking about college already. So instead of what students and parents hear at college orientation, I talked about hundreds of small schools where they could get as good an education for less and have more fun. I told them how proud we were of our son who joined the Marines out of high school, and after serving his country honorably for four years, attended and graduated at a state university in Maryland. Only then did I mention we were also proud of our daughter who went to Stanford. Our youngest daughter had four wonderful years at LBHS, then after Saddleback finished at Azusa Pacific. We were able to be a part of her life with her roommates who became part of our family. Those were some of the best years of our lives. Parents in our town and around the nation too often think achievement by children in school defines achievement of parents in life, and use wealth to purchase influence to engineer education “success.” Not just infamous education scandals, but unfair advantage taken in pervasive petty corruption. Sadly, that delegitimizes instead of valuing a child’s unique gifts, and stigmatizes children in their own hearts and minds for life. All I can say is, there but for the grace of God go those parents who don’t fall into that trap and take their children low with them, whether they get caught or not. Walls – China has its Great Wall, Romans had their Hadrian’s Wall, Russia had its Berlin Wall, Israel has its Western Wall, so I guess it is only natural that Trump wants a wall – perhaps he could build one around Mara Lago to protect himself? Some Laguna Beach parents rented service animals just prior to their children taking some finals to comfort them. Perhaps we can collect money and hire some comfort animals for the many children that are in “cages” because of their status as illegal immigrants? I wonder what that person who picked up their dog’s poop, put it in a bag, tied and knot, and then tied the bag to a low branch on a pine tree in Moulton Park was thinking. I was able to reach up and bring it down. What other things are people thinking of doing to be cute or…? 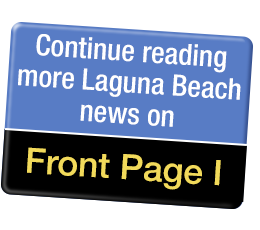 I wonder how many more educational meetings are being assembled by Village Laguna and the Beautification Council so that we understand their mission and vote for their friends/candidates when they try again to take control of City Council and City Hall – the same control that they had during the late ‘80s and ‘90s? Please note that the information they collect from those attending will most likely be used to garner support for their campaign in 2020. I loved this article and was excited to see St. Helena Island mentioned (even if it was in context of arsenic poisoning!). There were many accusations that the British were trying to poison Napoleon during his exile. In fact, after his death, books and articles were written claiming all kinds of appalling abuse. At least we know that it wasn’t intentional arsenic poisoning – the green was the fashion of the time! My mother was from St. Helena, and the island is a beautiful gem in the middle of a vast ocean. Very remote, and until recently, only accessible by a 5-day boat journey from Cape Town. (There is now a small airport with a once-weekly flight from South Africa). Thanks again for piquing my interest! The community seems to like rotation of officers, so the Board first tried to keep the rule and just deny the benefits to Perry. The Board seemingly thought she would suffer in silence. But she refused to be silenced without speaking up, and that stressed the culture of the Board. One Board member asked seemingly middle school student council level questions about Board meeting procedures, directed to Legal Counsel brought in at taxpayer expense to defend the Board’s actions. The lawyer did his best to treat the questions as adult level discussion, but in the end referred her to Robert’s Rules of Order rather than Board rules and legal issues the lawyer was being paid to explain. Then the same Board member’s spouse complained that I was repeating myself and making his wife late to come home! Then he questioned my right to address legal issues because I am a lawyer in Washington DC and not in California. Does California really need more lawyers? Was I there as a lawyer, and if so who was my client? Or was I citizen volunteer just like his wife? If not illiterate about civics he would know I was using my three minutes on multiple agenda items to prevent the Board majority from silencing me, and each time I spoke augmented the official record with new and different facts about Board actions. That was called creating a record for future political and legal purposes, so stay tuned. It was disappointing to read that the majority of the City Council is not in favor of hiring a historic preservation planner, which has been supported both by the Task Force and the Heritage Committee. Many of the complaints heard before the City Council concerning historic preservation could have been mitigated by a more knowledgeable person at the counter in City Hall. The Heritage Committee does not see these applications. I commend Toni Iseman for recognizing the resident serving aspect of this position. Having a knowledgeable person explain both the benefits and the responsibilities of owning an historic structure would make it possible for the applicant to make an informed decision. Ideally this position should be filled by someone with experience with historic preservation in other municipalities and also qualified to do historic assessments. Handing a resident with an historic structure a list of resources just doesn’t cut it. One of the reasons people come to Laguna Beach is that we are not like our neighboring communities. Part of this is the historic nature of our downtown and our neighborhoods. Hiring someone experienced with historic preservation can help preserve one of our greatest assets, while giving residents the information they need to make informed decisions about their properties.